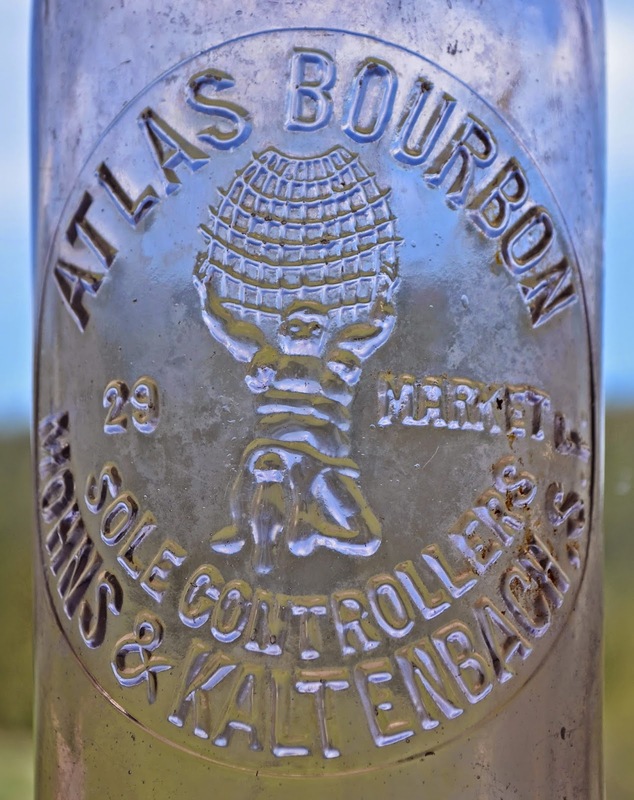 A couple of weeks ago we had an Atlas Bourbon, (#29 in the 4th edition), arrive on consignment. It had over an inch of what appeared to be petrified linseed oil in the bottom, and generous amounts of the same stuff stuck to the sides of the interior as well. It was yellow, stunk to high heaven, and all but impossible to break down. It was, to say the least, tenacious... Acetone, nope. Carb cleaner, nope. Gunk Degreaser, nope. Geez, what is this stuff?! Finally, my old standby, Tri Sodium Phosphate (tsp), came to the rescue. After two weeks to the day of soaking in concentrated TSP, it gave in. Once cleaned of the contents, it became immediately evident that it was much different than the few Atlas Bourbons that I'd seen before. Atlas is in a slightly different pose, the world is egg shaped, (instead of round), the North Pole looks to have melted, (climate change I guess), and the spacing on the lettering is notably different. The base and kick-up is also different and there is no base mark on it. Compare the "new one" above to the previously documented mold. The differences are easy to spot. We knew of a variant without the "29 Market" embossed on it, but it's odd that a brand which never really took off, had two very similar molds made. Wishful thinking that the brand would sell better than it did? 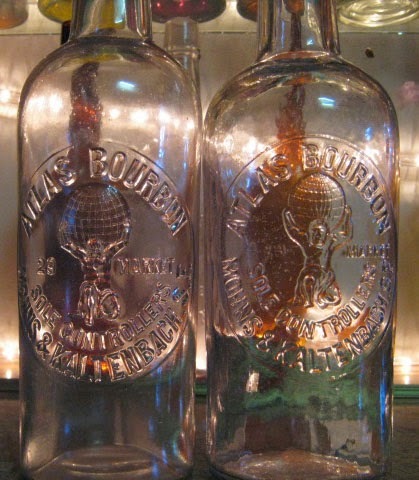 The bottle is not mint; it retains some stain both inside and out, has some rust transfer on the right side of the embossing pattern, and has some scratching. It has a slight imperfection on the base with what appears to be a small (1/8" - 3/16") surface annealing check (slight partial thickness only); these appear to be in manufacture when viewed through a loop. The bottle (it's the one on the left) has a nice sun colored amethyst hue, and would most probably respond well to a professional cleaning. We've only had one other available, and that was over ten years ago. This one is available for purchase at an extremely attractive price. Feel free to touch base if it's of interest. I'll be happy to forward more photos or answer any questions. Just received an email from a friend down in California. It seems that there is at least one more of the "new" (now not so new) variant known. He's had his for over twenty years. Here's a photo of the entire run of three variants; side by side. The reason for the variant without the address just became apparent. Wilson stated that the firm dates ca. 1895 - 1900 located at 29 Market St., and Barnett listed dates as ca. 1895 - 1901. I've just located a listing for 1894. They were located at 319 California. Both molds on the right appear to be identical. My guess is that they were anticipating the move, had the mold initially cut, sans the address, and then had the 29 Market St. added after the relocation of the business. They were also sole agents for the Eagle Glen brand. The firm did indeed last through 1901, and became Mohn and Mohns in 1902. 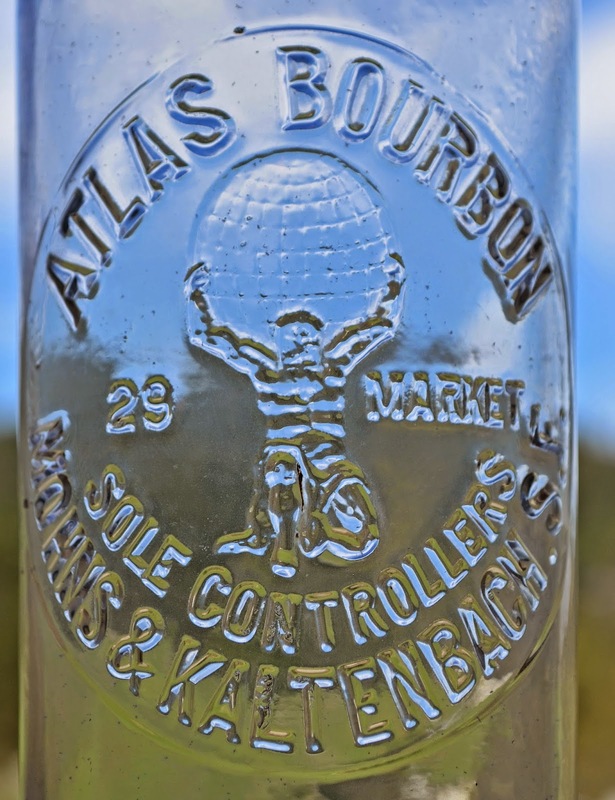 The new firm continued to push the Eagle Glen brand, but dropped the Atlas brand, no doubt due to meager sales. One of the great things about this website is the ability to share. Show and tell, so to speak. "Hey Bruce here is a totally different Atlas it is shorter the embossing is different and it is very crude much like the Henry Campe"
Yep, another undocumented variant of the Atlas. A squattier version of the other three. The owner went on to say that "the top is crude lots of glass but no drip or orange peel the glass is selenium". And then there were four. The input from one and all is much appreciated! 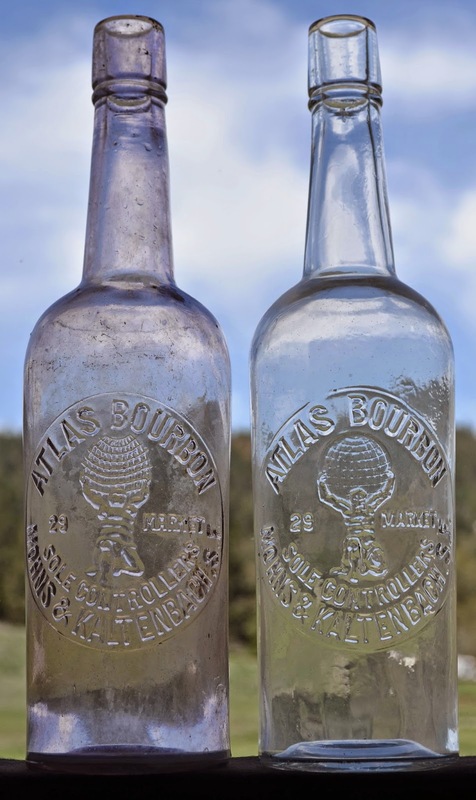 For what it's worth the Germans, although they had a virtual monopoly on the worlds supply of manganese dioxide prior to the first war, chose not to use it as a decolorizing agent in glass that was exported to the west coast in the form of liquor bottles. It may have had something to do with the chemical makeup of the sand that Gerresheimer Glasshuttenwerk (Abramson Heunischs "German Connection") in Gerresheimer Germany used as the basis for their cullet. The "amber" bottles attributed to this firms production are all shades of red, ranging from blood red to shades of orangish red. The clear examples all have either a straw or steele undercurrent due to the addition of Selinium Dixoide. If irradiated, the clear bottles will turn color but, instead of purple, the selenium dioxide causes it to be transformed into an odd transparent topaz amber. Not a true amber as we know it, but more like weak iced green tea. And, unlike sun colored amethyst, it will gradually begin to revert back to it's native clear (with the off tint) over time.